The Federal Road Safety Corps (FRSC) has again warned motorists driving against traffic on the Lagos-Ibadan expressway to desist, saying anyone arrested would be booked and subjected to psychiatric check. The ever-busy expressway has been experiencing lockdown in recent times following the ongoing construction work by Julius Berger. But the Lagos State Sector Commander of the FRSC, Mr. Hyginus Omeje, told newsmen at the weekend that behind the blockade were unscrupulous motorists driving against traffic. According to him, the impatience on the part of drivers had caused so much chaos and harrowing experience for motorists on the ever-busy corridor. 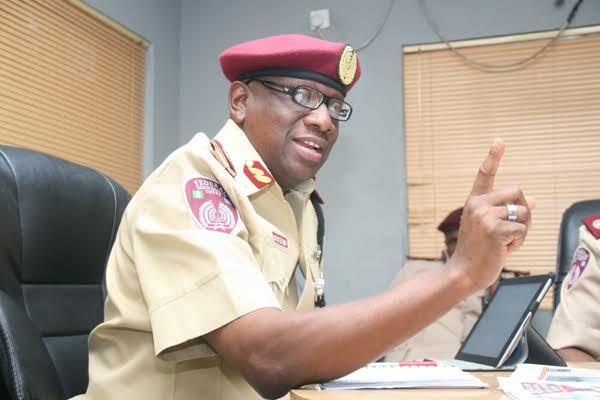 He said the FRSC would impound the vehicles of any erring motorist arrested driving against traffic, saying the impatient attitude of drivers must stop to have free flow of vehicles on the expressway. Omeje said, “A good assessment of the road which l have done severally, reveals that there is nothing wrong with the road other than there is everything wrong with the users of the road. “Although, the road is undergoing rehabilitation and expansion which has gotten to Magboro by MFM Church and at that point, Lagos to lbadan bound traffic was diverted to share lane with that of lbadan to Lagos. “The problem is always compounded anytime motorists create additional lanes or driving against traffic leading to crashes. “We will soon start to book the erring road user compounding problems on that corridor,” Omeje said. Omeje explained that some construction companies from OPIC had put signage from 50k/m, 80k/m and 100 km per hour speed limit. He said, “No spirit, no demon that is causing anything on that road but the attitude of the road users impatience and lawlessness.